California artist David Simpson (American, b. 1928) is a reductivist artist who had been important to the Bay Area art scene since the 1950s. Working initially with metallic paints, and later with interference paints, his paintings shimmer and alter in the light, depending on their angle of view. Simpson’s paintings are made through a process that he has developed over time. Canvases are stretched and prepared conventionally with acrylic paint. It is sanded to a velvety smooth surface in preparation for the interference paints. As many as thirty layers of paint are applied to the canvas using a special metal trowel that the artist designed. Interference paint contains micro-particles coated with titanium oxide or mica. When interacting with light, the refraction produced creates optical illusions of depth, shadow and hue. 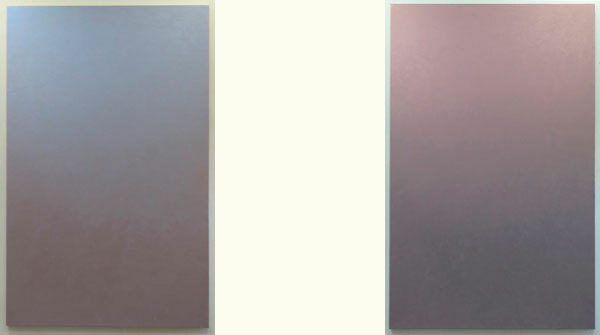 Simpson has exhibited extensively in solo and group exhibitions. His work is in such prestigious collections as the Museum of Modern Art, New York; Museum of Contemporary Art, San Diego; and the Baltimore Museum of Art, Maryland. He has his MFA from San Francisco State College and BFA from the California School of Fine Arts. He lives and works in Berkeley, California and is represented by Charlotte Jackson Fine Art, Inc., Santa Fe. California artist David Simpson (American, b. 1928) is a reductivist artist who had been important to the Bay Area art scene since the 1950s. Working initially with metallic paints, and later with interference.